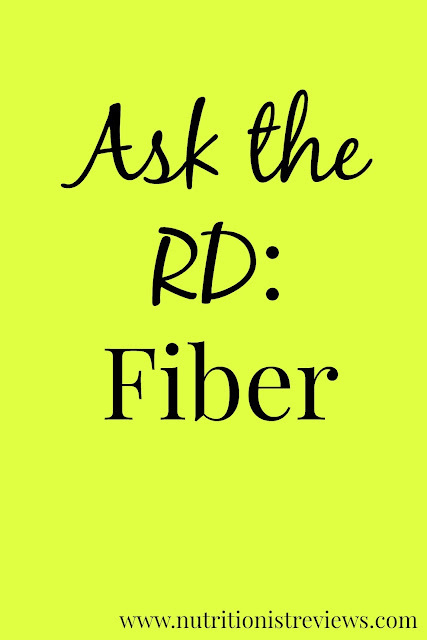 What is fiber? Why should I eat it? What does it do to my body? Many people do not know a lot about fiber and that I why I am here today to explain all about fiber to you. Fiber is roughage that comes in plant foods. There are two types: soluble fiber and insoluble fiber. Soluble fiber ferments in the large intestine and is great for your overall health as well as slows digestion. Insoluble fiber absorbs water and bulks up your stool. Fiber is what helps fill you up when eating a meal which is great if you are trying to stay healthy and fit. How much fiber should you eat a day? Adults should get between 25-35 grams of fiber per day. Most Americans get only about half of this recommend amount. Fiber does more than just bulk up your stool. It is great at preventing disease such as cancer (particularly colon cancer), high blood pressure, cardiovascular diseases, diabetes, obesity, etc. It also helps to stabilize blood glucose levels, lower LDL which is the bad type of cholesterol, and increase the production of immune cells. Fiber is great for the body! Can't I just take a fiber supplement? While a fiber supplement is okay if you really do not like any of the foods full of fiber, fresh foods are the best source of fiber. I would not recommend a fiber supplement in most cases. I see that foods such as Fruit Loops contain fiber. Is that a good source of fiber? This is kind of the same as fiber supplements. Companies are adding fiber to their foods to make them seem healthier. I do not think that this is a very good source of fiber and would recommend cereal such as bran flakes with added fruit on top as a much healthier source of fiber. 1. Beans- black eyed peas, chickpeas, butter beans, pinto beans, etc. 2. Nuts- almonds, peanuts, etc. 3. Fruit- especially raspberries, pears, blackberries, strawberries, apples, plums, etc. 4. Vegetables-especially broccoli, spinach, corn, potatoes with the skin on, carrots, peas, etc. 5. Whole wheat products, barley products, oats. great post!! I LOVE Kashi Go Lean Crunch to fiber-pack my mornings :) I also enjoy adding flaxseed meal to most of my homemade meals to give them a fiber boost! Hi! Just stopping by and following you from Tuesday's Blog Hop. HI!! Tuesday blog hop, new follower! Would love a follower back! PS. I LOVE EATING NATURAL AND HEALTHY! Favorite way to get fiber is oats, and sweet potatoes. Oh and Luna bars, yum! Around my house, a popular breakfast is oatmeal with frozen berries in it. Just stir in the berries (straight from the bag in the freezer door), and let it sit for about 2 minutes. The berries melt while cooling down the oatmeal. Thanks for the great information! I am a new follower and look forward to reading more! My family is trying to eat healthier, more natural foods and less processed!